Lighting Choices Save You Money. 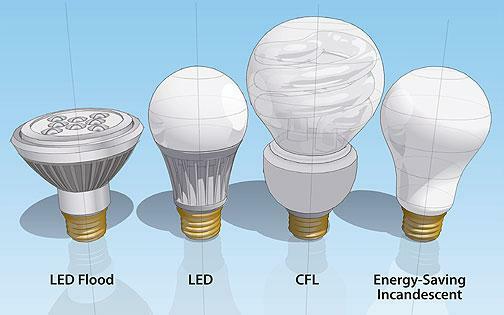 Energy-efficient light bulbs are available in a wide variety of sizes and shapes. For the greatest savings, replace your old incandescent bulbs with ENERGY STAR-qualified bulbs. An average household dedicates about 10% of its energy budget to lighting. Switching to energy-efficient lighting is one of the fastest ways to cut your energy bills. Timers and motion sensors save you even more money by reducing the amount of time lights are on but not being used. You have many choices in energy-efficient lighting. The most popular light bulbs available are halogen incandescents, compact fluorescent lamps (CFLs), and light-emitting diodes (LEDs). Although they can initially cost more than traditional incandescent bulbs, over their lifetime they save you money, because they use less energy. Energy-saving, or halogen, incandescent light bulbs are about 25% more efficient and can last up to three times longer than traditional incandescent bulbs. They are available in a wide range of shapes and colors, and can be used with dimmers. 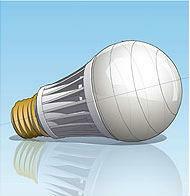 CFLs contain a very small amount of mercury and require special handling if they are broken. 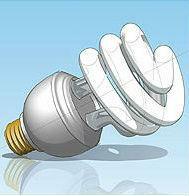 CFLs should be recycled at the end of their lifespan. Many retailers recycle CFLs for free. Visitepa.gov/cfl for cleanup and safe disposal steps. In addition to standard screw-in bulbs, you’ll find LEDs in applications such as recessed downlights, desk lamps, kitchen undercabinet lighting, and outdoor area lights. Replacing 15 inefficient incandescent bulbs in your home with energy-saving bulbs could save you about $50 per year. For the greatest savings, replace your old incandescent bulbs with ENERGY STAR-qualified bulbs. When remodeling, look for recessed light fixtures or “cans” which are rated for contact with insulation and are air tight (ICAT rated). LEDs work well indoors and outdoors because of their durability and performance in cold environments. Look for LED products such as pathway lights, step lights, and porch lights for outdoor use. You can also find solar powered outdoor lighting.